Fondant is a sugar paste that can either be poured or rolled. Rolled fondant is much more common. 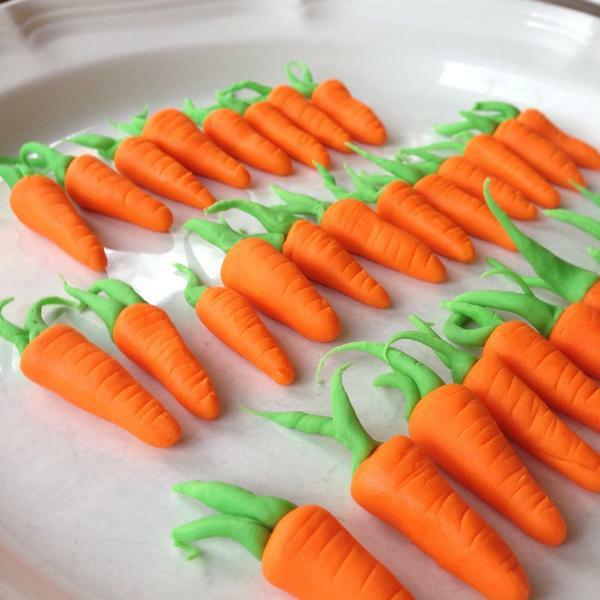 I made these carrots by kneading orange and green gel food coloring into white fondant, softening it with the warmth from my hands and then rolling it into the appropriate shape. I try to refrain from using fondant most of the time, because it doesn’t taste very good and it is easy to go overboard with it. However, used conservatively it can add a nice touch. Fondant was developed in the 1500’s and was made using rosewater, sugar, lemon juice, egg white, and gum dragon. Nowadays, there are many more hard-to-pronounce preservatives included in the store brand. Alternatives to rolled fondant are marzipan (almond paste) or modeling chocolate (see my lego cake). those look amazing, great job! !